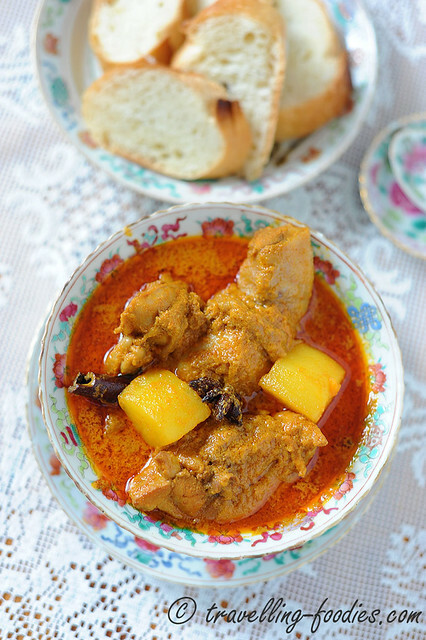 Kari Ayam is a familiar favorite to most of us here at home. Different communities have their own versions, be it the Malays, Indians, Peranakans, Eurasians or the Chinese. Even within each ethnic group, one could easily find a plethora of variations to the which this dish is being prepared, differing by the concoction of spices or other ingredients used, and sometimes even with the process which the curry is being cooked. I remember reading someone exclaim that the number of ways we know of today to cook curry is as plentiful as the stars in the sky. Well, that is a lovely literary exaggeration if you ask me, but that said the piquant flavours which this dish is beautifully imbued with is by no means any less stellar. 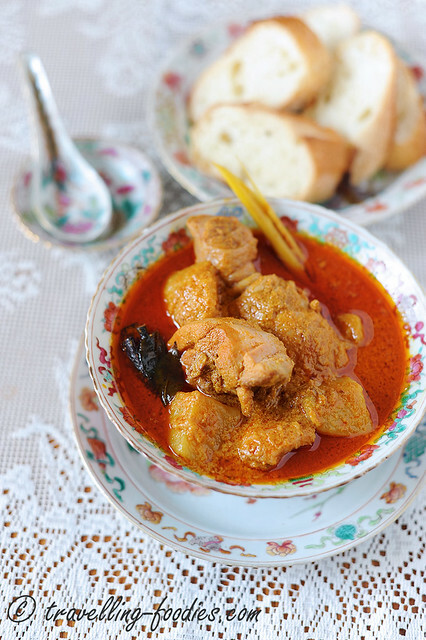 A very versatile dish which can be served in so many different ways, kari ayam is quintessential in Peranakan cuisine and often makes its way onto the dining tables of Straits Chinese households, be it for day-to-day meals or elaborate affairs like the tok panjang where it assumes the role of the “kuah merah” dish. 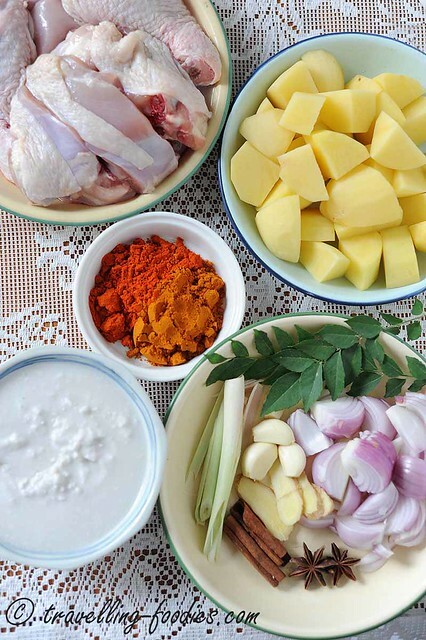 For many Peranakan families, Kari Ayam is almost like rice, a staple which is being cooked almost on a weekly basis, not only for its popularity, but also the “flexibility” to how it could be enjoyed. While it can be eaten with rice, be it nasik chueh (steamed rice) for regular meals , or special events like the first month celebrations of a newborn, where kari ayam was traditionally given away, alongside nasi kunyit, “telor merah” and kueh koo merah to friends and relatives of the family. Otherwise, it can used to chelop (dip) roti peranchis （Asian version of the french baguette)，roti jala (lacy crepes) or drizzled over bee hoon goreng where the strands of fried rice vermicelli would gladly soak up all the santan-enriched goodness, making it all the more yummilicious! Despite being a very popular and common dish, every family has their own unique way of cooking. While some family recipes include cili merah (fresh chilies), others simply content themselves with serbok cili (chili powder) in addition to serbok kari (curry powder) while I have seen some who use both. Some families grind their own concoction of spices for the serbok kari, using handed down “secret recipes” befitting of “heirloom” status. Others who do not or not longer produced their own curry powder swear by only those churned out by certain Peranakan families who mass produce them for sale. And of course some families would gladly use commercially available curry powder off the supermarket shelves, fuss-free and hassle-free, not to mention cheap and good yet cooking curries which are no less delicious! Some folks subscribe to the addition of daon kari (curry leaves) and seray (lemongrass) and yet I have heard of others who claim that kari ayam cooked by the Peranakans should not have seray or daon kari simply because their grandmothers did not add them into their curries. Sudah la… To me, Kari ayam is one dish that personifies the Peranakan community we see today, similar and concerted as a whole but so varied and different when one looks deep down to the details and intricacies. 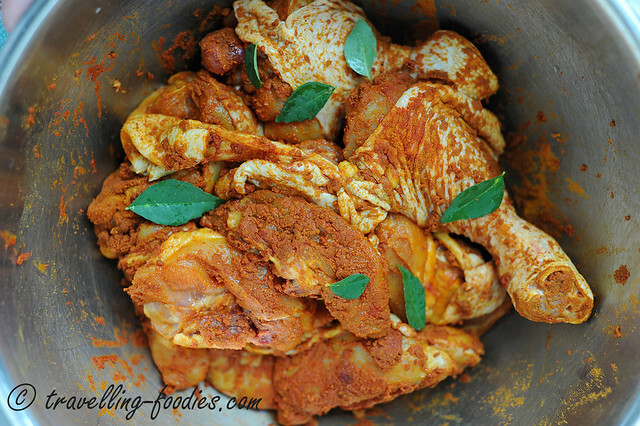 The Kari Ayam recipe I’m sharing in this blog post is from a friend who generously shared with me. She in turn learnt it from her mum, Madam Goh Kim Gek, who is a Malaccan Nyonya. I love the recipe for its simplicity. Toksah tumbok bahan-bahan manyak, toksah rendam cili kering, suma pun tak susah… these were my initial thoughts when I tried out the recipe. Yet the final outcome is so flavourful, because of one important step, which is to marinate the chicken chunks with curry powder, cili powder and a bit of salt. This is absolutely crucial as it allows the complex and multitudinous flavours of the spices to slowly work their way into the meat. If time permits, overnight marination in the refrigerator is recommended. Otherwise, an hour or two is sufficient to make a world of difference in your curry making if you had not done this before. 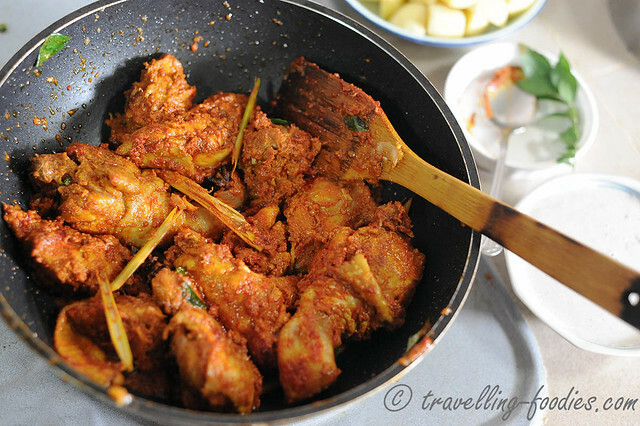 Another important step is the frying of the simple rempah followed by the marinated chicken chunks. There must be sufficient oil to tumis all the ingredients so as to tease out all those piquant flavours and sweetness from the onions, shallots and garlic, and at the same time, work on the aromatics of the spices. So please do not scrimp on the oil for fear that it would be too much. In any case, excess oil would most definitely rise to the surface when the concoction pecah minyak as the dish is being cooked, so fear not. More curry powder and cili powder is added during the tumis stage as well so a medium low flame is needed to prevent the spices from burning. As such, a longer cooking time is also to be anticipated, and patience is of essence here to make sure that all the ingredients are nicely worked up to their potential for maximum palate sensation. After that, santan （coconut milk) is added to form the base of the kuah, with a small amount of water. The intensity of the coconuty goodness very much depends on individual preference as some do not like their kuah kari to be too lemak and jelak. Most understandably so but one should be mindful not to cut down the santan by too much as it would void the kuah of its intended richness, an important attribute which a good kari ayam should have. Mix all the ingredients thoroughly, rub each piece of chicken thoroughly with the powders and salt and marinate for at least 1 hour, preferably overnight in the fridge. Blend or pound the peeled shallots or onions, garlic and ginger to form a coarse paste. Set aside the additional curry and chili powder for later use. Note: some may also blend the chili and curry powders together with the rempah ingredients but I think it is better to separate them, and introducing the powders slightly later during cooking to prevent the spices from burning. Add marinated chicken chunks. Stir fry until all the chicken are well coated with the fried ingredients. Continue to stir fry under medium heat for another 10 min. Add water as well as half the amount of coconut milk and potatoes. Bring the mixture to a boil before simmering with lid on for 20 min. The MSG-free chicken bouillon cube should be added now if using. Taste and adjust the flavours with more salt. A bit of sugar may be added to balance the flavours while ground pepper can be added for an additional spicy edge. Add remaining thick coconut milk and return to a boil before simmering to medium-low heat for the last 10-15 min or until the chicken and potatoes are soft and thoroughly cooked through. A sprig of curry leaves is added at this point to “refresh” the aroma of the dish. 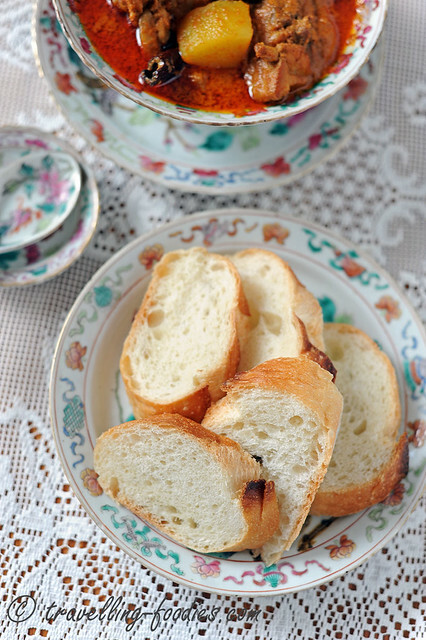 Serve warm with rice, roti peranchis or roti jala. This entry was posted on October 16, 2014 by Alan (travellingfoodies). It was filed under Food, Simple Eats and was tagged with Baba, chicken, chicken curry, cinnamon stick, curry leaves, curry powder, kari ayam, lemongrass, nasi kunyit, Nonya, Nyonya, Peranakan, potatoes, Roti Jala, roti peranchis, seray, spices, straits chinese. Your curry chicken is making realise how much i miss having it . It looks soooo good and i like having it with bee hoon somehow it taste better to me than bread . I am all ready to try out your recipe .Thank you for sharing ! Hi Alan, I tried your chicken curry and it was delicious!!! I substituted coconut milk with some evaporated milk to reduce the “lemak-ness”. Like you stated, it’s simple and yet tasted fabulous…yay!!! Can I use beef instead of chicken? I absolutely love Kari Ayam (in all it’s many forms) but this is the variety I really crave, with that lovely orangey-red sauce and creamy, spicy flavour. I’ve tried quite a few recipes with varying success but this is the next one I will try and I have a feeling, if I can make it as well as you obviously can, that it will be my “go to” Kari ayam recipe. 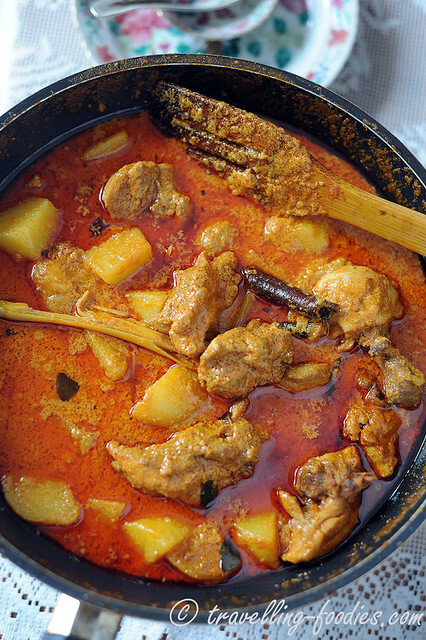 My mouth is just watering like crazy looking at the photos – you can’t beat chicken and spuds in a good curry sauce no matter which part of Asia you’re from! Baba Curry powder..is it the same as Baba meat Curry powder ? Tks for your yummy recipe but instead of 500 ml of thick coconut milk, i used 250ml and 200 ml of water. It’s delicious. Is it ok to substitute ginger with lengkuas? Hi Alan! Pls advise. Can substitute ginger with lengkuas? Thanks. I tried out quite a number of your fantastic recipes. Your recipes are detailed even for amateur cook, like me.